Our best selling line, beautiful crystal clear Bubble Balloons filled with 12 small latex balloons, finished with a collar of balloons and matching Organza, personalised with any message – stunning! 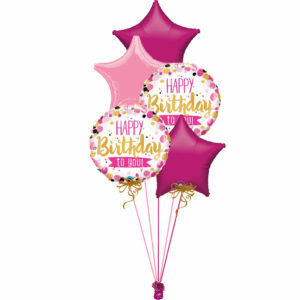 Whatever the age, we have all the birthday balloons you’ll ever need! Whatever the occasion, we have all the character balloons you could wish for! 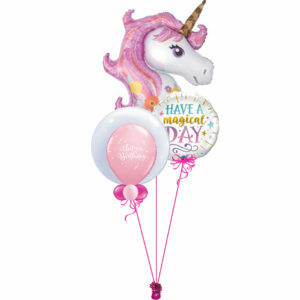 Magic Balloons have been supplying artistic, creative and imaginative balloons for over 30 years. We specialise in personalised helium balloons both hand written and with custom logos. We have crystal clear Bubble Balloons, Foil Balloons in all colours, shapes and sizes and Latex Balloons (from tiny 5 inch to massive 8 foot). We can supply Balloon Decoration for any event from a small function to a huge promotion to a complete ‘one-off’ balloon installation. We deliver around Greater Manchester in our own bright red vans and throughout the rest of the UK by courier. We supply TV, Theatres, Football Clubs, Multi National Companies, Event Coordinators and, of course, individuals. Take a look at our latest creations! Watch us create an explosion of balloon colour. 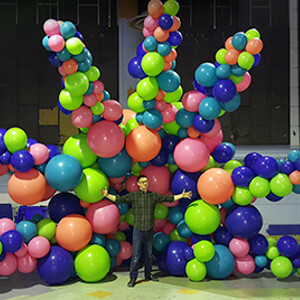 This huge free standing starburst of balloons is over 5m high and 7m wide. We can reproduce your design in balloons for a truly memorable event. Magic Balloons updated their status.